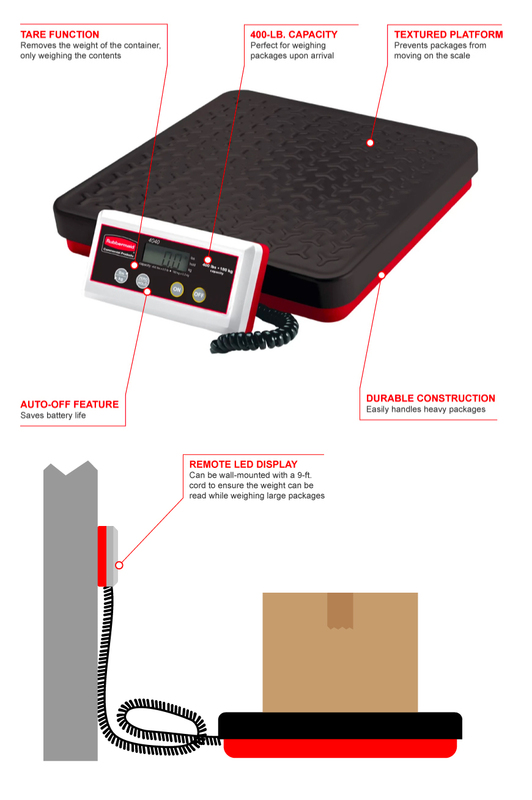 The Rubbermaid FG404088 digital receiving scale has a 400-pound capacity and a durable construction, perfect for weighing large packages and containers when they arrive. The platform is textured to keep packages in place and sits on non-skid feet to provide stability when weighing. The tare function measures only the weight of the contents without the container's weight. A remote LCD display shows weight for simple monitoring. The 9-foot cord mounts to the wall to prevent large containers from obscuring your view of the weight. 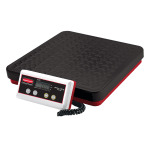 The Rubbermaid FG404088 digital receiving scale has a temperature range between 41 and 95 degrees Fahrenheit.